After this coming weekend, Sheena and I will have moved 4 times since last March. I think we are close to some kind of record! Last year we sold our Spokane condo in 9 days, and since then have moved as opportunities have presented themselves. This morning we signed the closing documents on our new home, located in Bonney Lake. It’s a foreclosure, so we have a little cleaning to do and need to purchase appliances. On Friday we pick up the keys, and begin our 4th move since being married 4 years ago! This time, we plan to stay a little bit longer! Fortunately we have downsized quite a bit, so the moving process should go quite quickly. Our closest estimate is 2 hours to load our storage unit and apartment, and 30 minutes to unload with 4 able bodied persons. Soon, I will be blogging and working from my new home office. Recently I passed my Real Estate license exams, so I will be available to help you buy or sell your home sometime in July. May we continue to realize the grace that God continues to offer us, and may we always desire to know truth. It’s a God thing! !…or is it? Last night, while working through an assessment and exam on Microsoft Access (Not a hard program, but it’s main flaw it that it’s designed by MS) I needed something to keep my mind working. Often times when using PC programs I tend to get frustrated with it not responding the way a mac would, and it really irritates me. So to keep my mind fresh, I will listen to music or a podcast to allow a balance to occur. Which is what I did last night. 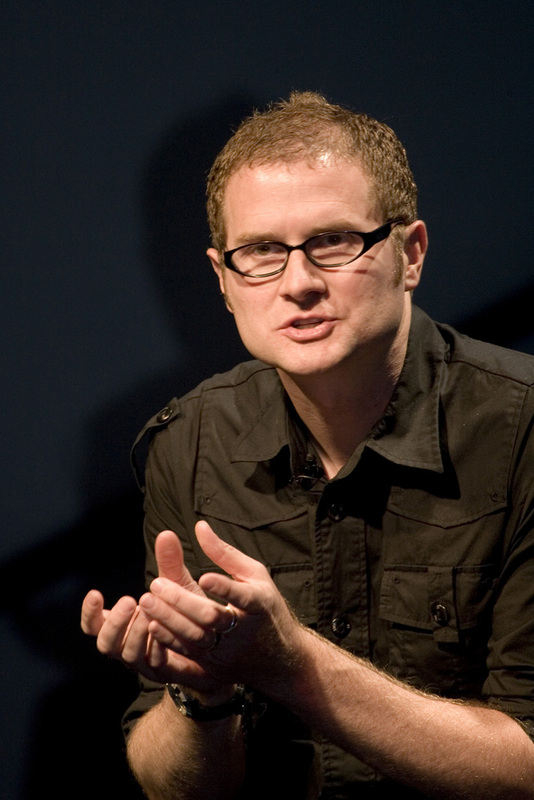 I was listening to a new podcast from Rob Bell @ Mars Hill and he starting ranting on a thought he had while speaking. Have you ever heard someone say, “Oh it was such a God thing!” or “I know, we were so blessed, such a God thing.” I’ve always found it to be an interesting statement, and one that seemed to be so simple and yet just thrown around. Why is it that only times of “American styled blessing” do we say it’s a ‘God Thing’? I know that the Bible says “every good and perfect thing” comes from God, and I would agree with that statement. But what about the suffering? What about the sacrifices we often have to give and live through? Couldn’t those also be ‘God Things’? We don’t like to say that because we can never imagine a God who asks us to sacrifice, but isn’t that just what Jesus asked us to do if we truly want to follow him? Without sacrificing our own desires and way of life preferences, we can’t truly pick up our cross and follow him. Therefore, I propose that we stop labeling everything that has a material benefit for us and things that go as we had expected or desired them to as “God Things” and begin to think of life as a God Thing. Sacrifices often more Sacred than Blessings. God’s Blessings are Rarely Financial. I appreciate Bell. He thinks the way I want to. What is the truth behind the truth? This life isn’t about you, it’s not about me. It’s about a powerful, all present and knowing God who created the earth, and everything on it. It’s about knowing Him, learning to live in unity with His spirit and love. It’s not about fighting to be right, but rather to live a life of sacrifice. We suffer way too much from sh*t that never happens! I follow a select number of people through the phenomenon known as Twitter. Ranging from Pastors, Missional Teachers, Friends, Commentators, and one actor. That one actor I started to follow after watching an interview with Conan, and I’m not 100% sure why! It may have been because he is okay with being who he is. He’s okay with having a beard that looks like it may be a home for the twitter bird. Jim Carrey, often times hilarious, occasionally offensive and sporadically calm. His smile is recognizable, and while I’ve never met him, I think he would be crazy fun to hang out with. Maybe it was the shi*t that caught my attention, but it got me thinking! Jesus says in Matthews record (chapter 6:25-27)“Therefore I tell you, do not worry about your life, what you will eat or drink; or about your body, what you will wear. Is not life more important than food, and the body more important than clothes? Look at the birds of the air; they do not sow or reap or store away in barns, and yet your heavenly Father feeds them. Are you not much more valuable than they? Can any one of you by worrying add a single hour to your life ? I’ve found that many times I suffer from my perceptions of what others possible perceptions of me. Stress seems to find an open door into my life through worrying too much about the future- allowing stress to affect me before it needs to. Sort of like Jesus warned his disciples in Luke 21:14.